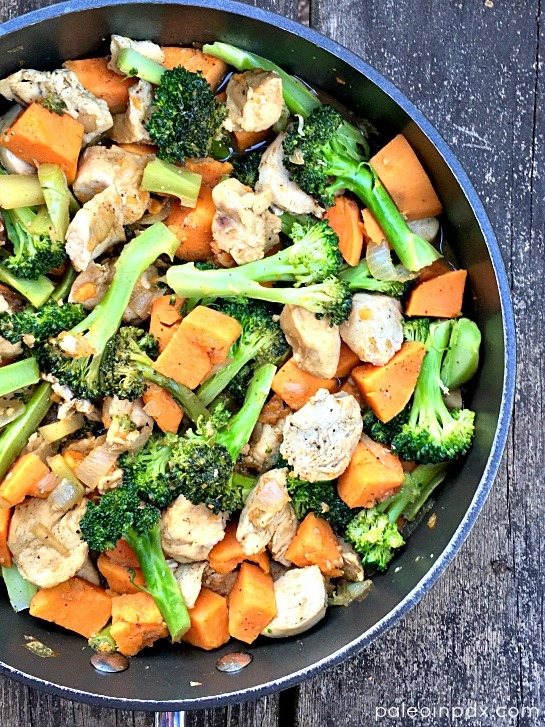 Mark this citrus herb chicken and veggie bowl as a delicious, easy, healthy and flavorful recipe. It’s great anytime, but especially when life is extra busy. It’s loaded with fresh veggies, cubes of chicken and citrus herb flavor. Speaking of citrus herb flavor, the marinade really works its magic in this dish and takes it to the next level. You can find the marinade online at Thrive Market (get 25% off your first order HERE) or at Whole Foods. I highly recommend giving it a try! On a separate note, I am so excited for tomorrow because I’m going to see Jim Gaffigan live here in Portland! I can’t wait to laugh a lot, kick back, and spend quality time with Jesse and our close friends. For those who don’t know, Jim Gaffigan is a comedian and one I’ve been wanting to catch live for a long time. My opportunity is finally here! Melt ghee in a large pan over medium heat. Add the onion and garlic, and sauté for a couple minutes. Then, add the diced chicken and season to taste with sea salt and black pepper. Continue to cook for about 5-6 more minutes, until chicken is nearly done. Add the sweet potato and stir. Reduce heat to medium-low and cover for 2-3 minutes. Then, add the broccoli and marinade, and more sea salt and/or black pepper, if desired. Cover again and let cook for 5-6 minutes, stirring occasionally. Check doneness of broccoli and sweet potato, and if need be, let cook a little longer.